Underlying all progression of natural muscle growth is the ability to continually put more stress on the muscles. This stress is a major component involved in the growth of a muscle and disrupts homeostasis within your body. 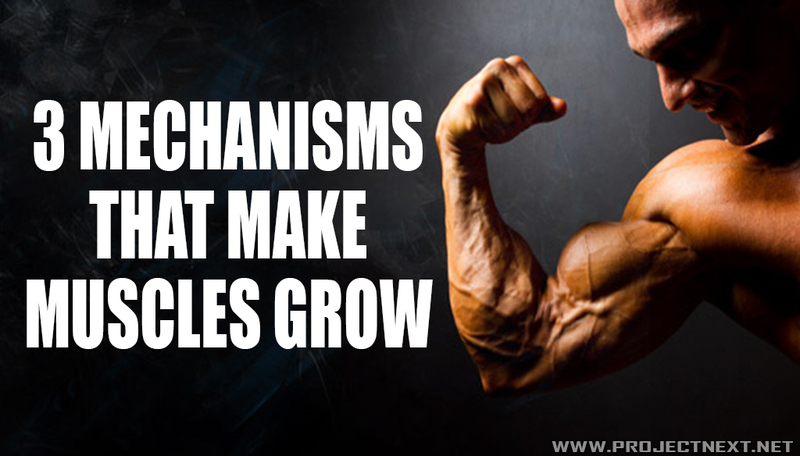 The stress and subsequent disruption in homeostasis causes three main mechanisms that spur on muscle growth. Muscular tension also most dramatically effects the connection of the motor units with the muscle cells. Two other factors help to explain why some people can be stronger, but not as big as other people. If you’ve ever felt sore after a workout, you have experienced the localized muscle damage from working out. This local muscle damage causes a release of inflammatory molecules and immune system cells that activate satellite cells to jump into action. This doesn’t mean that you have to feel sore in order for this to happen, but instead that the damage from the workout has to be present in your muscle cells. Typically soreness is attenuated over time by other mechanisms. If you’ve ever felt the burn of an exercise or had the “pump” in the gym, then you’ve felt the effects of metabolic stress. Scientists used to question bodybuilders when they said the “pump” caused their muscles to become larger. After more investigation, it seems as though they were onto something. Metabolic stress causes cell swelling around the muscle, which helps to contribute to muscle growth without necessarily increasing the size of the muscle cells. This is from the addition of muscle glycogen, which helps to swell the muscle along with connective tissue growth. This type of growth is known as sarcoplasmic hypertrophy and is one of the ways that people can get the appearance of larger muscles without increases in strength.